The recent cold affecting much of the country puts limits on outside activities for lots of people, but there are a lot of active creatures out there who don't mind, as long as the snow is deep enough. They are the denizens of the subnivean, which is not the layer in the drawer below the hand cream, but rather the active world beneath the snow. Subnivean happenings unfold in the space between the ground and the snow that is created as snow gets draped over plants, trees, bushes and other things. We discussed the molecular magic of ice and snow in early December – not only does snow’s molecular structure make it less dense than water, but it also makes snow a great insulator, particularly light, fluffy snow. Just 25 cm of snow can result in constant temperatures a bit above or below 0oC at ground level when surface temperatures plunge to -20-40oC. But don’t trust me. 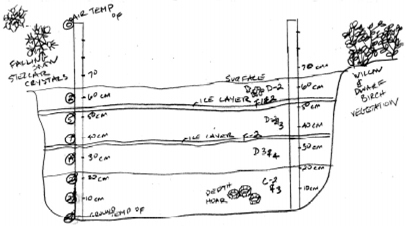 Find your own snow bank, dig a pit, and record the results (click here for lessons). Solidifying warm gelatin in clear canisters (scroll down) might actually be more fun. Keep in mind that snow thrown by plows or shovels will be denser and provide less insulation. 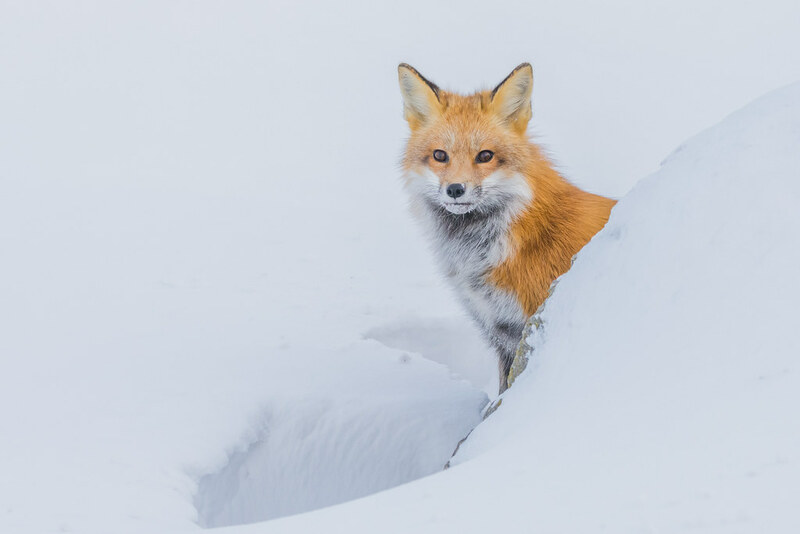 With lots of snow, small rodent populations can explode in winter, since snow increases the habitat where they can move around relatively safe from predators. 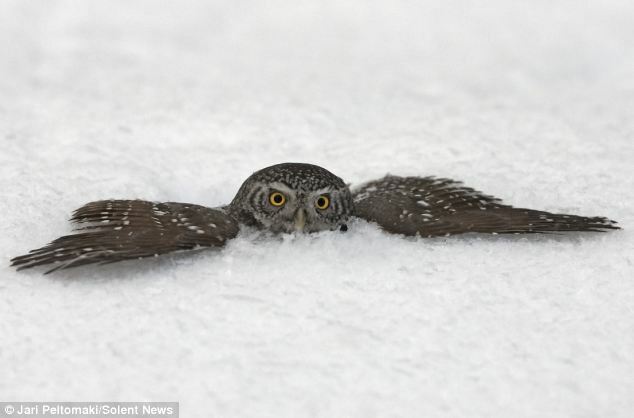 But not entirely – owls, particularly the Great Gray, are adapted to hear and plunge through 30 cm of snow to capture prey, sometimes leaving perfect marks to tell the tale (of course, they aren’t always so elegant about it and may occasionally underestimate snow depth). However, freeze/thaw cycles will result in a hard enough crust that the owls cannot penetrate, jeopardizing their survival. “Chalk one up for the rodents,” you might think, but that crust can also limit gas exchange to the point where all oxygen below the crust is used up and the rodents die. Crusty conditions can put other wildlife at risk, too. Global warming may lead to more of these cycles, in some areas. And what would happen if there was more winter precipitation, but also warmer weather to melt it quicker? Which species would be the winners and losers? We don’t know the answers, or how exactly numerous factors will interplay, but certainly it will lead to cascading impacts and significant ecosystem changes. Everything is connected. 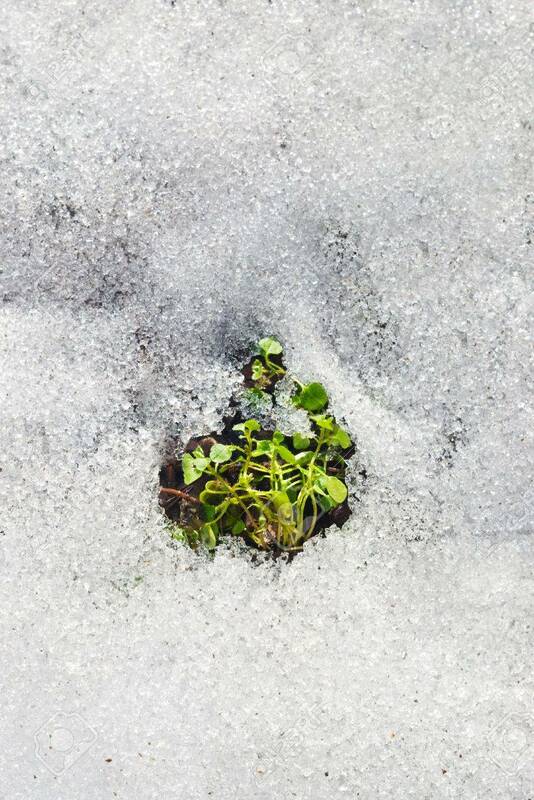 Towards spring, plants in cavities beneath the snow may have their own greenhouse, getting enough sun and humidity to get a leg up on plants either exposed to the elements or buried under deeper snow, even to the point of blooming. Soil microbes, particularly fungi, may actually reach their peak biomass under the snow. Here’s more on the ecology of snow, life beneath the snow, and simple activities for producing subnivean dioramas and studying winter temperatures. Pukak (poo-cack) the layer of bonded, granular snow that covers the ground. Animals travel through the pukak layer, where the heat from the earth keeps them warm. Siqoq (see-kok) drifting snow, the kind that makes “snow snakes” drift across the snow or road. Qali (kal-ee) snow that collects on tree branches and fence posts. Api (ah-pee) snow on the ground. Make up your own names. What would you call “snow melting away from the exhaust vent”, or “snow pounded by many feet on the playground”? Having trouble getting across metamorphism? Then take your class and go make snowballs! Just as you can compress a loaf of Wonder Bread into a 5 cm cube, you can take those fluffy snowflakes and mash them into a dense ball, using heat and pressure. Just as Superman once made a diamond out of a lump of coal in his hand(here’s the more recent movie scene), you are changing, or metamorphosing, the structure of water. Cut the ball open, and dare them to find the snowflakes. 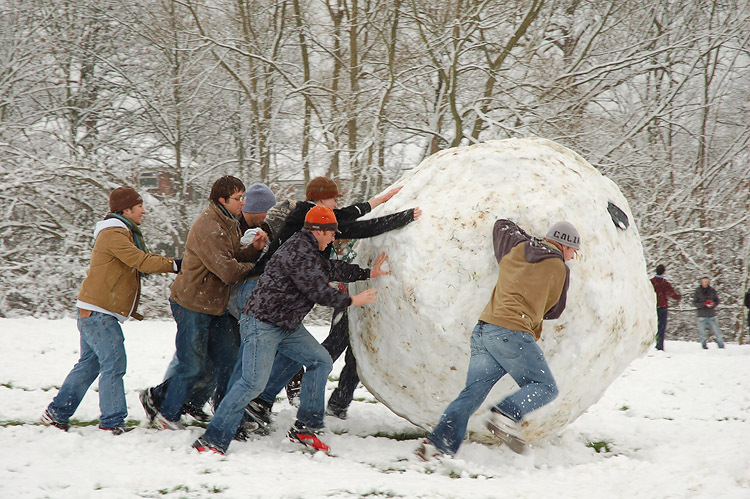 Then have fun throwing all those snowballs at….a tree, or a wall, or something else, hopefully inanimate and unbreakable. Usually about now, on the coldest day in the dead of winter, I hear my first male chickadee mating song of the season, reminding me that spring isn’t really that far off. Keep your ears open for that three note, “Hi, Sweetie!” and dream of warmer times. Or listen up for their “chick-a-dee-dee-dee” calls and count the number of “dees,” because dee is for danger! Chickadee communication doesn’t stop there and birds see things in ways we can’t – in ultraviolet. Apparently, male chickadees that shine the brightest are the sexiest! Remember The Great Scaup Mystery from the mid-October guide? Well, if you had a chance to read about the mysterious decline of the Greater and Lesser Scaup(a North American species of duck), here’s an update for you: the Long Point Waterfowl (LPW) scaup research program has announced that selenium (a contaminant) is probably not a major factor in causing the scaup’s decline. This is contrary to LPW’s previously hypothesis that ingestion of zebra mussels by scaup’s was leading to increased selenium levels in their tissues, which in turn caused reproductive impairment. So, what’s causing the decline? The mystery continues…. Monarch butterflies that migrated south in late August and September are over-wintering in unique habitat on twelve isolated mountaintops in Mexico. Unfortunately, their numbers reached an all time low during the winter of 9/10. 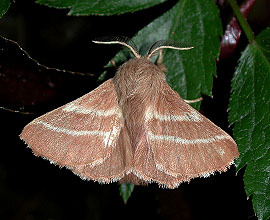 The previous summer’s weather conditions across their U.S. and Canadian breeding and migration grounds is thought to be the main factor behind the low. However, loss of habitat and its food source, milkweed, due to herbicide use had already contributed to declines. The number of Monarchs more than doubled in 10/11, but fell off again by about 28% in 11/12 . The 12/13 winter’s population was the smallest ever recorded -- 41% of the previous year and 38% below the previous low. The 13/14 levels were even worse at 55% below the winter before. But finally, there was some good news! The population increased by 68% in 14/15 due to excellent breeding conditions across North America, although still 80% below the long-term average. Based on summer breeding conditions, tagging data and fall migration data, populations were expected to double in 15/16, but they didn't — they increased by 354%, only 30% below the long-term average. Unfortunately, the population in 16/17 fell back to half of that average, and decreased even more last winter, although there is anecdotal evidence (scroll down) to counter that. This past fall, early migration numbers appeared to be heavy. Check back in March to see the population for this winter. Eastern Tent Caterpillars spend the winter in the egg stage, which are easily seen, particularly in the branches of Black Cherry trees. 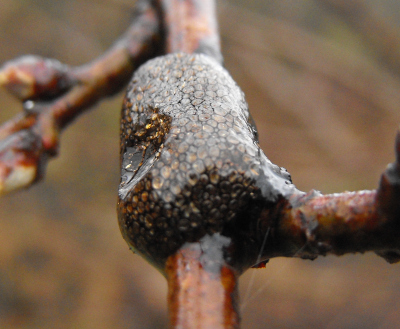 These trees also often have black knot, a viral disease. In the water under the ice of many of our lakes, bass are dormant while Brown Bullheads and Common Carp bury themselves in the mud, but Walleye , Yellow Perch , Northern Pike , Lake Whitefish , Round Whitefish, Lake Trout and Rainbow Trout remain active. Generally, they can be found in the warmest part of the lake, usually within 15 to 30 cm of the bottom. Occasionally, fish will approach the ice to feed on smaller fish attracted by plankton concentrations. The days are finally getting longer and the sun is climbing higher in the sky. Try marking that event by measuring shadow length at noon over several days or weeks, using, of course, the same kids. The shadows will shrink as the sun rises (unless your kid is growing really fast). You can also measure the sun’s altitude above the horizon using those ever so useful children. Don’t forget about the total eclipse of the moon on the 20/21st. Venus and Jupiter are close together in the morning sky of the 22nd, while Saturn and the moon join the party on the 30th and 31st.